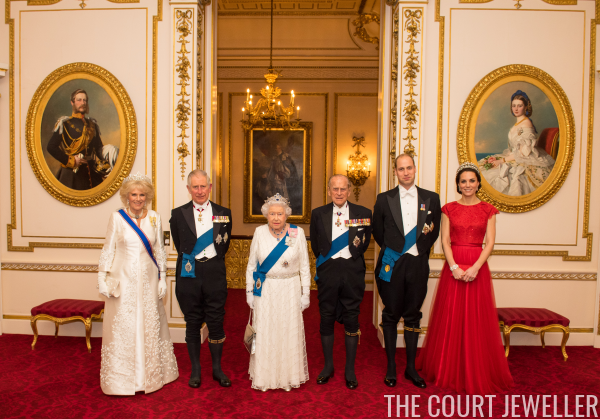 Tonight, the royal family hosted the annual diplomatic reception at Buckingham Palace. 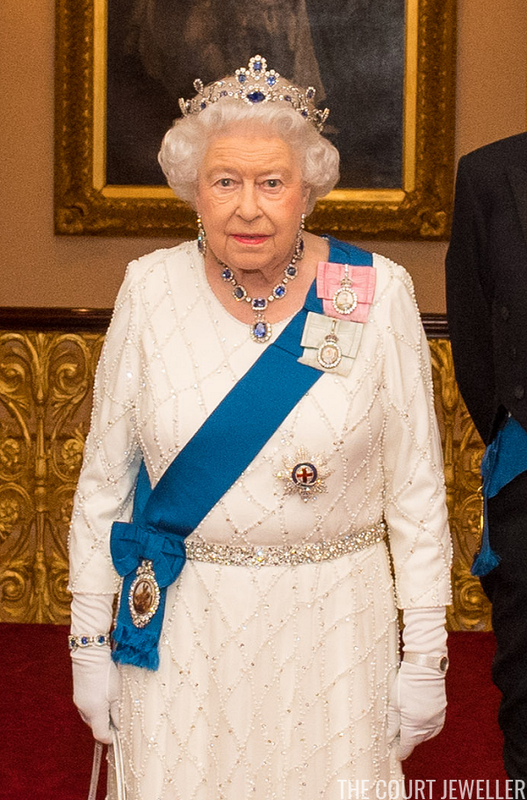 Unusually, we have photographs of the jewels worn by all of the senior royal women in attendance! Hooray! The Queen wore her sapphires: the Belgian Sapphire Tiara with the George VI Sapphire Suite. The set has been one of her most-worn in recent months. 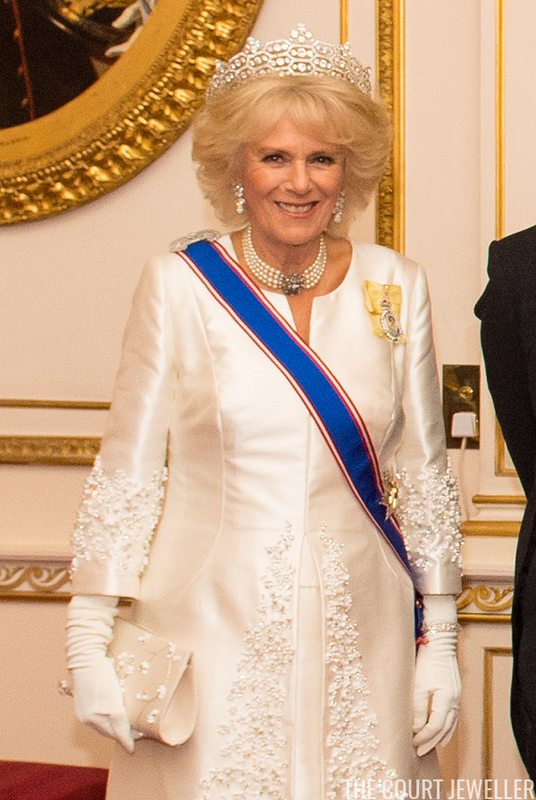 The Duchess of Cornwall wore familiar jewels: the Greville Tiara, plus her diamond earrings (last worn at Tuesday's Royal Variety Performance) and one of her pearl necklaces with a diamond clasp. And the Duchess of Cambridge wore Queen Mary's Lover's Knot Tiara (the copy Queen Mary had made of the original Cambridge Lover's Knot Tiara), along with earrings recently loaned to her by the Queen. In the group photo above, you can also see that Kate is wearing the Queen's diamond wedding gift bracelet, which was a present from the Duke of Edinburgh. 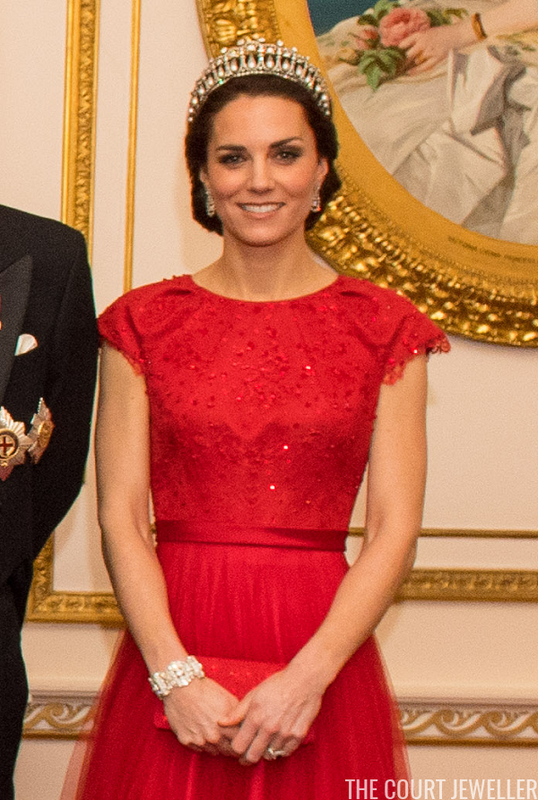 The bracelet includes diamonds that were part of a Romanov wedding gift to Philip's mother, Princess Andrew.